Not that I want to lie ship wrecked and comatose drinking fresh mango juice. Or have goldfish shoals nibbing at my toes for that matter. No, as I've made clear before when I get shipwrecked I want beer. Not that I got shipwrecked this weekend but the sun was out so it was time for fun. To be more specific it was time to get to some beer gardens and drink some beer. On Friday evening I strolled down the canal to the Rowbarge with the lovely Lisa for a pint of pride. The place was packed out so we only stayed for one before heading home for some home brew. I thought pubs must all make a killing as soon as the sun comes out but on Saturday at the Cricketers in Horsell I was proved wrong. This is a big pub with a large garden but despite the sunny weather it was practically empty. It really is a hard time for pubs at the moment. Mind you at this pub the prices (£3.30 for a pint of pride here) might have put off boozers less dedicated than the lovely Lisa and me. Though my desert island beer selection is subject to constant change the top three beers are guaranteed a place. They're beers that have been just perfection in a glass when I've drunk them. Ind Coope Burton Ale was the first cask beer I ever drank and the moment is etched forever on my taste buds. As a fresh faced young man I was on the road to Damascus when I stopped at a roadside hostelry called the Sovereigns. It was my habit at the time to just ask for bitter when I went to the bar. I'd be given keg bitter which was cold, brown and fizzy and didn't have much taste. When it was my round this time a mate asked me to get him a 'Burton'. This sounded a bit weird to me but I ordered it anyway and saw it was served from the mysterious hand pumps adorning the bar. My curiosity being sufficiently aroused I sneaked a surreptitious slurp. The effect was astounding: a blinding light struck me and I heard a roaring in my ear and I fell to my knees. A booming voice spoke to me: "Ed! Ed! Why do you persecute me?". "Who are you?" I asked. "I the lord your beer, who you are persecuting by drinking pasteurised rubbish" was the reply. It continued: "You must get up to the bar and only drink decent beer from now on". As you can imagine I was a little surprised by this, but the Burton did taste damn good so I wasn't going to argue. "OK" I said, "I think I can manage that". And so I did. From that day forth I have been seeking out decent beer and not putting up with sub-standard shite. 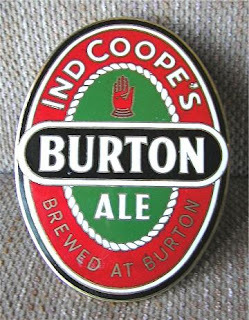 Ind Coope Burton Ale* is a pale ale with a hint of chocolate malt and dry hopped with Styrian goldings. Soon after I discovered it it won CAMRA's Champion Beer of Britain competition which vindicated my belief I'd found something good. Unfortunately having a national brewer's beer win didn't go down too well with some of the CAMRA faithful and the rules of the competition were changed to deny it automatic entry into the next year's finals. In fact since then the Champion Beer of Britain has pretty much been the preserve of beers from brew pubs or micros. As a cask conditioned beer it could at times be vinegar soup, particularly as these were pre-cask marque days. But at times it could be sublime, as on another memorable occasion when it tasted so good I wanted my mates to stop trying to talk to me so I could just concentrate on drinking the delicious nectar. 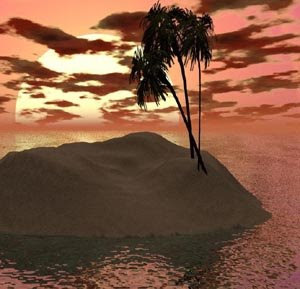 Sadly it's rarely found nowadays but I will insist on regular shipments to my desert island. *Technically speaking the beer style 'Burton Ale' is for something strong and dark like Old Peculier or McEwan's Champion so Ind Coope Burton Ale is in fact a pale ale from Burton. Well, it was until production moved to Leeds. Or not as the case may be. 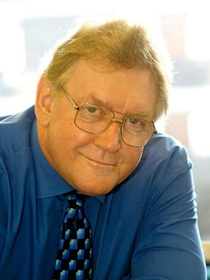 The latest edition of the Journal of the Institute of Brewing contains an excellent article by Graham Stewart, the recently retired chief of the International Centre for Brewing and Distilling at Heriot-Watt. The article is from a talk he gave outlining his forty years of brewing research, for which he has been awarded a medal! A pdf of the article is here. It's a bit technical in places but it covers a lot of stuff and is well worth a read if you're interested in brewing. I went to the Lake District again for the Bank Holiday weekend. It happily coincided with the Langdale beer festival. It was a fairly minor event, just some of the pubs putting on a few more beers than usual. I did my best to get round the pubs, I mean spend quality time in the mountains, whilst I was there. The selection wasn't overly inspiring but there were some nice beers to be had. The Old Dungeon Ghyll had the lovely Loweswater Pale Ale on. A beer of modest strength with good Cascade hops flavour it's very refreshing but I find that I can't drink beers like this in quantity. Strangely enough, considering the hot weather, stouts came off best for me. Conistion Special Oatmeal Stout at the Stickle Barn went down very nicely, which was a bit of a surprise as I normally find oats give beer an unpleasant oily mouthfeel, and Ulverston Stout Ollie at the Wainwright was a delicious beer full of rich dark flavours but without the astringency roasted grains often give to stouts. We didn't get anything too exciting from Booths this time though: some infected organic beer from Little valley which went down the sink and Ringwood 78 which was a bargain at £1 a bottle. I wish the Booths chain would spread to the South. I've always considered the question "What's your favourite beer?" to be unanswerable. There are so many factors affect which beer you like best at a particular time, such as the weather, how you're feeling, what stage of the evening you're at, where you are, etc. That's where desert island beers comes in. Like in desert island discs you get to make several choices, which is much more sensible as you wouldn't want to be stuck with just one beer. On the radio show they get a choice of eight records, so a choice of eight beers seems a good starting point, though the lovely Lisa sensibly that 12 would be better so a crate could be washed up on the beach each month. I'll expand on why I've chosen these beers when I get the time. Meanwhile, if anyone has any suggestions for beers I need to add please let me know. On Saturday night I went to a fancy dress party. A polypin of Surrey Hills Gilt Complex, a good hoppy golden ale, provided most of the evening's refreshment. Some of us nipped out to the ship early in the evening, which raised a few eyebrows. I don't think they get many robots in the pubs in Ripley. On Friday me and the lovely Lisa popped down to the Jolly Farmer in Worplesdon. This is one of our favourite local pubs. It's a bit posh and foody but it serves and excellent pint of pride and the pub actually has some character. As I was sitting there enjoying my pint I started pondering about why this pub was more pleasant than most. An obvious point was that we were in a small room off from the bar with only four seats in so it actually felt a bit cosy, which made a pleasant change from the drinking in a barn atmosphere all too common in pubs. As I understand it the reason so many pubs are open plan now is so it's easier for the staff to keep an eye on you. Wetherspoons also have their famously strict no hats policy so they can film your face, which occasionally results in grannies being bounced. At this point I paused in my pondering to look round and see if we were under surveillance. And sure enough though we weren't on camera there was a big curved mirror so the bar staff could keep an eye on us. Even here we were being watched. Why do you need to be constantly watched when you're in a pub? The idea of the 'panopticon', where you could be seen by the authorities at all times, was for prison design. Are we all now considered like criminals when we go to pubs? A pub landlord did recently win a fight against being forced to have CCTV cameras in his pub but sadly this seems to be the exception rather than the rule nowadays. I recently gave a bottle of strong porter I made last year to my brother in law. When asked what he thought of it he replied: "this beer's stockings!". A slightly unusual response it must be said. Apparently he meant to say the beer was shockingly strong. He wasn't wrong either, and to be fair he was half way through the bottle by then. The recipe was based on the 1750 porter in the first edition of the Durden Park Beer Circle's Old British Beers and How to Make Them. It's not one of their most historically accurate recipes and the malt we get nowadays isn't like the malt they had back then. It is though, as they say: "black, strong, bitter, nutritious and good". with 200g of goldings hops at the start of the boil. The O.g. is listed in my notebook as being 1.080 which seems a little low, maybe my mash efficiency was off that day, or maybe it was my own efficiency at reading the hydrometer. Either way, as can be seen from the reaction, it's not short on alcohol. Rummaging round my beer cupboard I spotted an Irish beer I'd got from Booths. It was St Patrick's Best from the Strangford Lough Brewing Co. You don't often see Irish craft beers so I was very interested in seeing how this one tasted. Sadly I didn't even get as far as tasting it. When I opened the bottle it gushed out of the top in a fountain, spilling about half the bottle over my kitchen counter and floor. There are a few possibilities for why beer can gush: over carbonation, wild yeast or bacteria infection, the use of isomerised hop extracts. But in cases like this one where it really goes mental Fusarium is the likely suspect. This is a fungus that can infect barley and cause considerable problems for brewers (and drinkers!). I don't think the mechanism for how it causes gushing is known but it certainly does a good job of it. I also have vague memories from when I was studying microbiology that some species of Fusarium produce a oestrogenic mycotoxin that does nasty things to the bits of boy pigs fed on infected barley. So I tipped the rest of it down the sink. I'm not taking any chances. A Fusarium sp. is also the fungus they make Quorn from. Though obviously not a species that makes your goolies shrink when you eat it. On looking at the label more closely it turned out that the beer was contract brewed somewhere in the EU, so might not even be an Irish craft beer anyway. I'll be giving it a miss in future. Labels: Booths supermarket, Strangford Lough Brewing Co.
Alright, the sky may have been clear and blue but I started work again today so it seemed a bit grim to me. Not that it will make me cut down on my drinking but it is going to eat into my brewing time. Two months after I posted about my tea flavoured beer an iced tea beer has been launched in Britain.Trend setter that I am I can't see it catching on. Iced tea's not exactly a big drink here so I'd be surprised if there's a huge market for an alcoholic version. Or should that be a pub walk in London as the CAMRA guidebook rather coyly puts it? Either way I got totally plastered last night. Me and the lovely Lisa met up with her siblings and partners at the Blackfriars. They had the excellent Timothy Taylors Landlord on and it was delicious. This was the start of my downfall as I'm pretty sure I necked four pints whilst waiting for people to arrive. I must try and remember in future that drinking four pints in the first stop on a pub crawl is not a good idea. Next stop was Ye Olde Cheshire Cheese. As it's a Sam Smith's pub I went for the keg wheat beer and very nice it was too. I've been to this pub a few times before but still keep discovering new rooms. This pub really is immense. They had a old poster on one wall telling you to 'Try A Smith'. The brewery it was advertising wasn't Sam Smith's or even John Smith's but WA Smith and Sons of Macclesfield. I've never heard of them and don't know when they closed. Perhaps it's time to crank up my beer nerdery and join the Brewery History Society? Then it was on to one of my favourites: Ye Olde Mitre. It was recently bought by Fuller's. Wonderful brewery that they are I was a little worried that it now be only Fuller's beers on sale. Happily guest beers were still available and I had a lovely pint of Deuchars IPA. I drank so much of this beer when I was living in Edinburgh that I'd actually got a bit bored of it. Having a decent range of cask beers in pubs is less common in Scotland than it is down South and if a pub did have cask beer on it was usually Deuchars or Caledonian 80/. I'm not a fan of heavy so it was Deuchars all the time for me. We managed to find a seat in the front bar, where I noticed there was a sign put up banning bicycles. Is people taking bicycles into pubs a common problem? In all my years of boozing I don't think I've ever seen such a thing. Still, fair play to the pub for banning them, the pub was crowded enough as it was without the ever present menace of people bringing in bicycles. After that it was on to another Sam Smith's pub, the Cittie of Yorke. It's another pub with an amazing interior, though not as old as it looks as it was rebuilt in the 1920s. The beer was starting to catch up with me at this point so I just had a half of their boring Old Brewery Biter. We then staggered on to the Seven Stars. This is apparently a grade two listed building but I was past caring by this point. They had five cask beers on, including three from the excellent Dark Star brewery. I had a pint of hop head as it's my mate Jim's favourite beer and very good it was too. Last pub of the evening was the Old Bank of England. A large Fuller's pub with another impressive interior. Not that you can really tell by this picture but I was three sheets to the wind by this point. I had a pint of pride here. ESB would have been more memorable but I really wasn't up to it at this point. We then went on to have an Indonesian curry, far too late for food really, and it means I'm now suffering from a ring stinger as well as a hangover. By my calculations I got in eight and a half pints last night, drinking over a gallon, which I'm sure we're all agreed is the mark of a man. I would like to thank the lovely Lisa for her excellent research, choice of pubs and map making that made this pub crawl possible. Particularly as there are 12 pubs on the map so we'll have to come back for another go! I put another brew on yesterday. The lovely Lisa had requested St Austell Tribute so hopefully it will be similar. Tribute has a pretty simple recipe and they're quite open with the ingredients they use. The main batch had 75g of Fuggles hops added at the start of the boil and 30g of Styrian goldings added ten minutes from the end. It will also be dry hopped with Styrian goldings at the conditioning stage. Tribute actually has Willamette hops as well but I thought this would do. The smaller one was a Radical brewing inspired hop free beer for my humulophobic brother. I was trying to flavour this with pine. I added 25g of new green shoots from last year's Christmas tree to the boil for this. I don't think it actually worked though, as I couldn't really detect any pine flavour in the wort. I may have to add a squirt from the toilet duck before bottling to get that pine fresh taste. By popular demand here's the recipe for my porter and stout that I mentioned here. A portion of the strong wort was then boiled with 15g of Goldings hops at the start of the boil and 10g added ten minutes from the end to make my stout. I also added 50g of black malt to this towards the end of the boil. The rest of the wort were used to make the porter and this was hopped with 90g of Goldings at the start of the boil and 29g ten minutes from the end. The yeast was Safale 04. I ended up with five litres of the stout at an original gravity 1.090 and 23 litres of porter at 1.048. I've only recently started parti-gyling my brews to get two different beers and I'm really pleased with the results. I get to make something strong and/or weird at the same time as making a batch of something more drinkable. After our bank holiday walk me and the lovely Lisa had some more refreshment in the Volunteer. This pub's an old favourite of Lisa's but we were a bit put off last time we visited as they'd covered the walls with tin foil. I've no idea why. It looked more normal this time. It's now owned by Hall and Woodhouse, a brewery I've never been particularly keen on. We had their Hopping Hare, a beer that I know is dry hopped with my current favourite hop Styrian goldings. Sadly the beer still had the distinctive, and to me unpleasant, taste of badgers beers so a bit of a disappointment really. There was a giant chess set outside but I wasn't tempted to play. I'm not fond of things in pubs that distract from the drinking and chatting. Me and the lovely Lisa popped in here for a pint before going for a walk on the bank holiday monday. It's a nice looking pub, but very foody and the beer range was unexciting. We had Ringwood best which was slightly sweet but otherwise pretty tasteless. On Saturday I carried out a carefully controlled scientific test. Well, almost. My friend Sarah ran the London marathon last Sunday and got given a goody bag containing a can of Fuller's London Pride at the end. Being a non-beer drinker she kindly passed it on to me. Being a beer nerd I normally don't drink cans but I'm not going to turn my nose up at free beer. It did occur to me though that rather than just guzzling it I could use it to do some scientific research. As Fuller's also do a bottled version of London Pride, and at 4.7% it's the same strength as the beer in the can, I thought it would be a good opportunity to see exactly what canning does to beer. So I decided to do a taste test with bottled and canned pride. When I was at Heriot-Watt there were regular beer tasting to compare different batches of beer. The method used was the triangle test. Rather than just compare the beers side by side you would be give three samples of beer, two from one batch and one from the other. You then had to spot the odd one out. I poured out two shots of bottled pride and one of canned. There was a difference in the carbonation level so I had to wait a while until the fizz had died down. Then I gave them to the lovely Lisa to taste. She spotted straight away the odd one out, so clearly the beers do taste different. Slightly oddly though she thought the canned beer was the bottled. When I tried the samples I had to agree that the bottled beer did taste more metallic. Now admittedly we had had a few by the time we got round to doing the triangle test, which is not ideal for taste testing. But we both agreed on this unexpected finding. I can only conclude that, as is so often the case with beer, more research is necessary. As I was up in London the other day I made a point of popping into a Sam Smith's pub, Ye Olde Cheshire Cheese. Run by a famously bonkers boss Sam Smith's pubs are unlike any others. Just about everything on sale is own brand and the prices very reasonable. Sadly the only cask beer they sell is very dull but on the plus side they do a good keg wheat beer and stout. One of their eccentricities is that they have no internet presence at all. Fortunately others have put a lot of information about them online. There's a map of their London pubs here. They're well worth visiting as many are fantastic old pubs that have had a fortune spent on very sympathetic renovation. Last night I was drinking some of my home brewed porter. It was based on the recipe for Ringwood XXXX porter in Graham Wheeler's Brew Your Own British Real Ale At Home. Ringwood porter is one of my favourite beers but as I didn't managed to find any in the pub this year I thought I'd have a go at making my own. It's great being able to make your own beer. Porter is often described as a once popular beer style that died out completely before being revived in recent years by microbreweries. When friends have asked me what porter is I've answered "like stout, but weaker". But even as I was saying this I'd think is this really true? Draught Guinness has an ABV of 4.1% so were historical porters weaker than this? Not at all, for most of the time they were brewed porters would have been stronger, and stout porters stronger still. So did porters contain different ingredients to stouts? No to that one too. Another beer blogger has summed up well the difference between porters and stouts: none, except that historically stout was stronger. So what did happen to porter? Looking at the ABV of draught Guinness it can hardly be called 'stout' compared to the other beers on the bar. So in historical terms Guinness is in fact a porter, and it's Guinness Export Stout at 8% ABV that has a genuine claim to being a stout. Porter never died it just changed its name to stout. I blame the marketing department. When I made my home brew based on the Ringwood beer I parti-gyled, taking the first runnings of strong wort off to make a stout and using the rest of my wort to make the porter. The same beer in two strengths, so porter and stout in the old fashioned sense. The colour of the porter was dark brown but not opaque, with slightly brown creamy head, a malty smell, chocolatey dark grain taste. I haven't been able to compare it to the Ringwood beer it's based on but my version is a little dryer than I remember the original being.